Louis Armstrong and Sarah Vaughn were two of the nationally famous entertainers who played in the brick building on this corner, once home to the popular Club Bali, also called the New Bali. In the memory of one former customer, it was a magic place, its rear garden lit with strings of lights in the summertime. 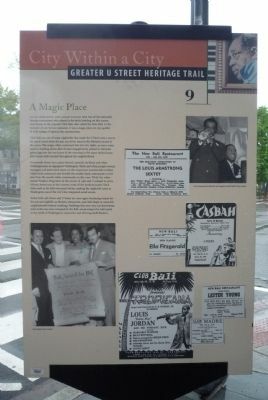 Club Bali was one of many nightclubs that made the U street area a mecca for music lovers from the jazz era of the 1920s to Motown sound of the 1960s. The magic often continued late into the night, as name entertainers, winding down after formal engagements, played to intimate gatherings int the wee hours of the morning in the many tucked-away, after-hours clubs located throughout the neighborhood. 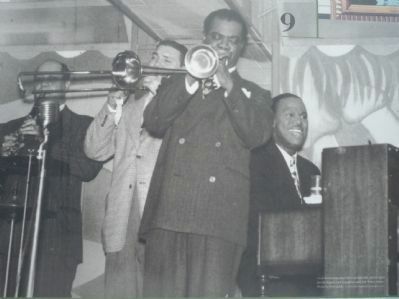 "Louis Armstrong plays the Club Bali with (left to right) Barney Bigard, Jack Teagarden, and Earl “Fatha” Hines. (Photo by Tom Lodge. 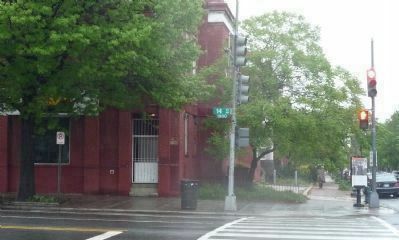 The Historical Society of Washington, D.C.)"
at the counter, most of the predominantly Black clubs such as the Bali welcomed Whites, making the nightclub scene in Washington one of the city’s few integrated social scenes. 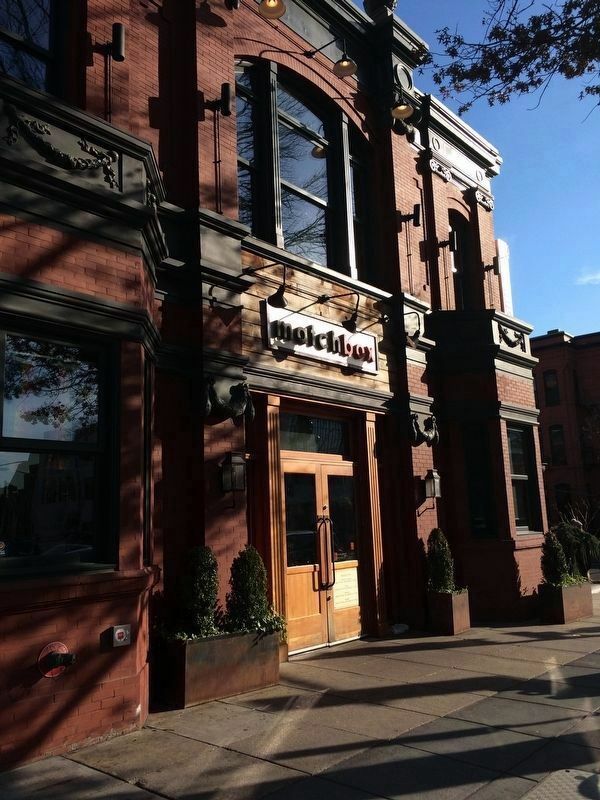 Today both 14th Street and U Street are once again becoming venues for the arts and nightlife, as theaters, restaurants, and clubs begin to reuse this neighborhood’s historic buildings. Buildings that were once car showrooms, such as the one once occupied by the Bali, are proving to be well suited to the needs of Washington’s innovative and thriving small theaters. Location. 38° 54.938′ N, 77° 1.907′ W. Marker is in Shaw, District of Columbia, in Washington. Marker is at the intersection of 14th Street Northwest and T Street Northwest, on the right when traveling north on 14th Street Northwest. Touch for map. Marker is in this post office area: Washington DC 20009, United States of America. Touch for directions. Other nearby markers. At least 8 other markers are within walking distance of this marker. Black Broadway (about 500 feet away, measured in a direct line); John Wesley Cromwell Residence (about 500 feet away); The Whitelaw Hotel and “the Duke” (about 600 feet away); Riots to Renaissance (about 600 feet away); "Sometimes I Feel Like A Motherless Child"
4. 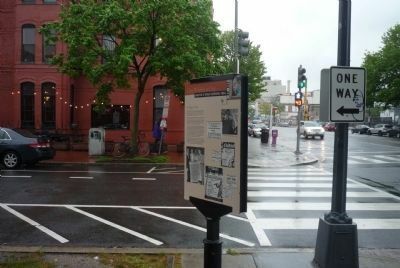 A Magic Place marker, at right, below the traffic light - view from across 14th Street. The building that housed the Club Bali (at left) is presently occupied by a rehearsal hall and costume shop belonging to the "Arena Stage at the Mead Center for Performing Arts" in Southwest DC. (about 600 feet away); "Old Man River" (about 600 feet away); "No More Auction Block For Me" (about 600 feet away); "Wade in the Water" (about 600 feet away). 5. 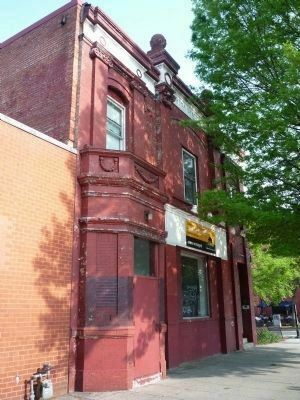 1901 14th Street, NW, the former home of the Club Bali/New Bali Restaurant. More. Search the internet for A Magic Place. Credits. This page was last revised on March 18, 2019. This page originally submitted on May 7, 2011, by Richard E. Miller of Oxon Hill, Maryland. This page has been viewed 616 times since then and 11 times this year. Last updated on March 7, 2019, by Devry Becker Jones of Washington, District of Columbia. Photos: 1, 2, 3, 4, 5. submitted on May 7, 2011, by Richard E. Miller of Oxon Hill, Maryland. 6. submitted on December 29, 2017, by Devry Becker Jones of Washington, District of Columbia. • Bill Pfingsten was the editor who published this page.